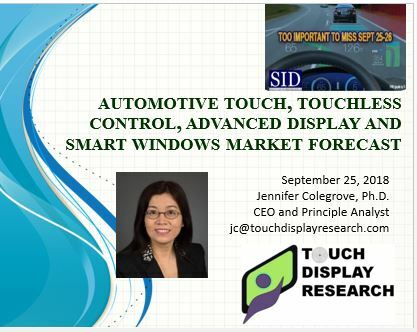 Smart Windows Archives - Touch Display Research, Inc.
November 14, 2018, by Jennifer Colegrove Ph.D. 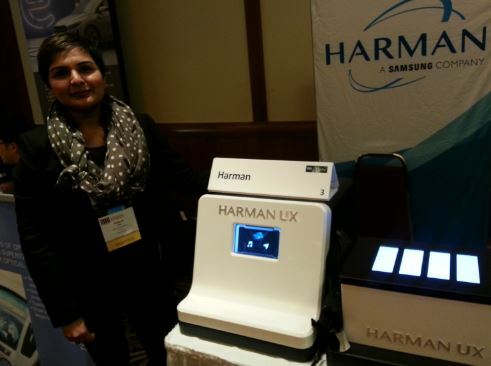 Principal Analyst, Touch Display Research Inc.
Merck’s smart windows business started from Peer+. Peer+ was a startup company founded in 2008 in Eindhoven, the Netherlands, to make liquid crystal windows. In 2011, Peer+ and Merck worked together to develop the liquid crystal that could stand the heat and cold of a window application. In 2012, Merck acquired 70% of the shares of Peer+. And in June 2014, Merck acquired the remaining 30% share. On October 23, 2018, Merck unveiled their new product brand “eyrise™” and announced the commercial availability of eyrise™ s350 in the EU and North America. Thanks to its unique features, eyrise™s350 provides a light wellness experience, as well as exceptional design freedom. The launch of eyrise™ s350 marks the 350th anniversary of Merck KGaA, Darmstadt, Germany which has pioneered the liquid crystal business for the past 50 years. eyrise™ smart windows will be used on the first full-façade installation for FC Group’s new headquarter building in Karlsruhe, Germany. The building is planned to open in 2019. We had an interview with Dr. Johannes Canisius, head of the Liquid Crystal Windows business at Merck, and Dr. Celine Glipa, global director of marketing & sales of the Merck Window Technologies. We asked about the licrivision brand and the eyrise brand smart windows, their capacity, supply chain, and future plan. 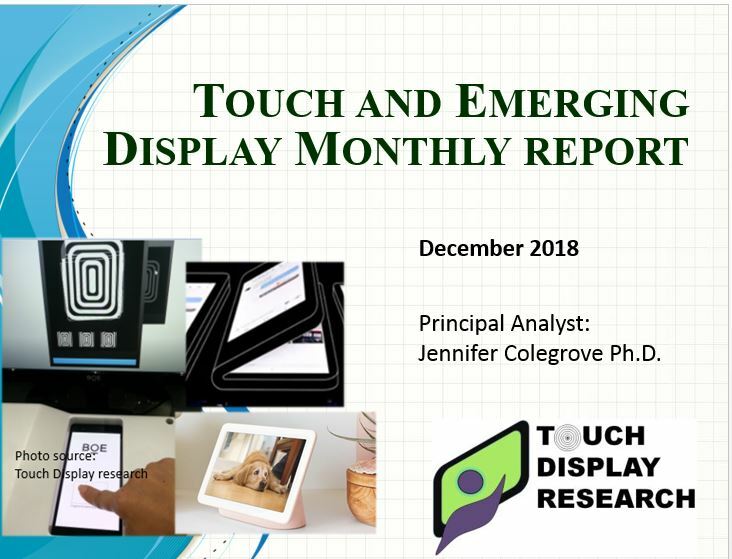 The full article can be found in the Touch and Emerging Display monthly report, November 2018 report. 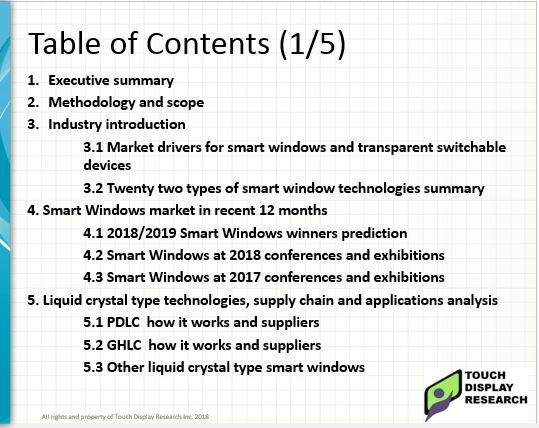 In the Smart Windows 2018-2028 report, we analyzed 22 types smart windows technologies and provided market forecast to 2028. This entry was posted in Smart Windows and tagged Celine Glipa, eyrise, Johannes Canisius, licrivision, Merck, smart windows on November 14, 2018 by jennycolegrove. October 12, 2018, by Jennifer Colegrove Ph.D. Principal Analyst, Touch Display Research Inc. The automotive industry’s adoption of new technologies has accelerated in the past couples of years. 11 display technologies will be used in automobiles: quantum dot with blue mini LED backlight LCD, quantum dot with blue regular size LED backlight LCD, white mini LED backlight LCD, conventional TFT LCD, PMLCD or segmented, AMOLED, micro LED direct view, PMOLED+VFD, micro LED HUD, conventional HUD and others. 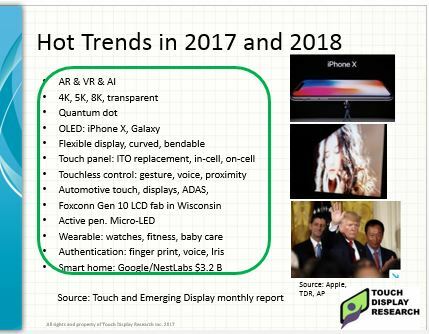 Market analysis and forecast with detail breakdown of 11 display technologies is provided in the Automotive Touch Display ADAS 2018 report. 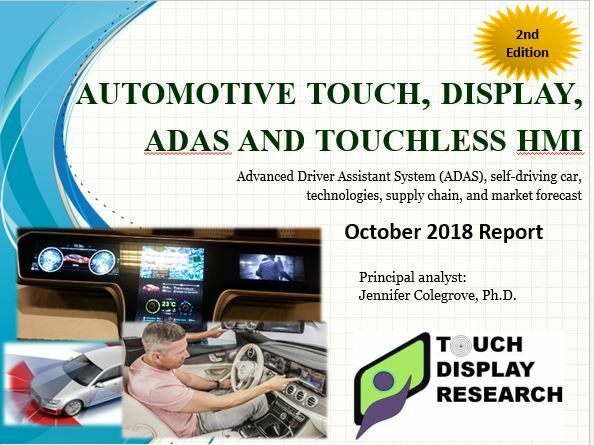 In the recently published “Automotive touch, display, ADAS and touchless HMI 2018 report, second edition” Touch Display Research Inc., a market research and consulting firm, analyzes automotive touch screen, display, ADAS (Advanced Driver Assistant System), and touchless human-machine-interaction (HMI) technologies and supply chain. This is the second edition with many update over the first edition (which was published in 2016). More than 500 companies working on automotive technologies are profiled in the report. This report mainly covers four parts of automotive industry: touch, display, ADAS and touchless HMI. In chapter 12, we also discussed other emerging technologies for automotive, including smart windows, haptic feedback, OLED lighting, augmented reality, virtual reality, artificial intelligence for automotive. This entry was posted in AMOLED, automotive, Displays, Flexible display market, Flexible hybrid electronics, Flexible OLED, Flexible touch screen, Gesture control, ITO replacement, metal mesh, micro LED, micro LED display, micro LED market report, micro LED report, microdisplay, Mini LED, OLED, OLED lighting, QLED, Quantum dot, Quantum dot market forecast, Smart Windows, touch screen, Touch screens, touchless control, touchless HMI and tagged automobile display, automotive, automotive ADAS, automotive display, automotive market, automotive touch screen on October 12, 2018 by jennycolegrove. Google just joined Universal Stylus Initiative in Jan 2018. Over 120 companies profiled in the excel database. Transparent conductor material industry had a shake out. 19 types of smart windows technologies and supply chain are analyzed in this report. Over 130 companies profiled in the excel database. 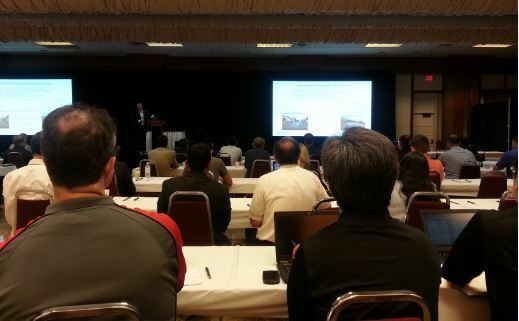 Dr. Colegrove, author of this report, performed first-hand surveys and interviews with hundreds of touch panel suppliers, ITO-replacement suppliers, smart window suppliers and OEM/ODMs in the last 10 years. Touch Display Research experts have been writing touch and display industry analysis reports for over ten years. You can access this expertise by purchasing and receiving the report today. 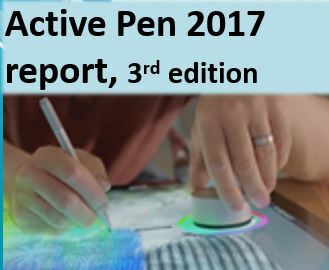 This entry was posted in Active Pen, ITO replacement, Smart Windows and tagged active pen market, Google, ITO Replacement, Market report, smart windows market, Universal Stylus Initiative on February 12, 2018 by jennycolegrove. Today, Merck announced it opened a new production facility for liquid crystal smart window modules in the Netherlands. The investment is around € 15 million. 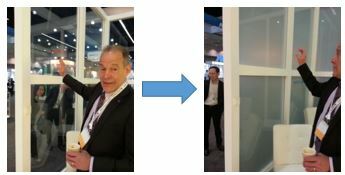 At SID DisplayWeek 2017 in California, Mr. Bob Miller, Senior Business Manager at Merck/EMD show us its liquid crystal smart windows in large format, see picture here. This is NOT PDLC (Polymer Dispersed Liquid Crystal), but only liquid crystal. 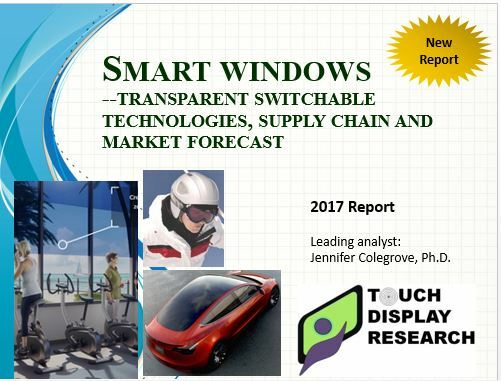 In the recently published “Smart Windows Transparent Switchable Technologies, Supply Chain and Market Forecast 2017 Report,” Touch Display Research Inc., analyzed 19 smart window technologies, which include 16 active smart window technologies and 3 passive smart window technologies. Some can be both active and passive. 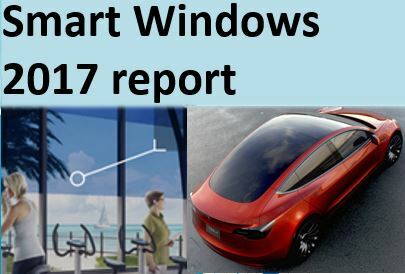 More than 130 companies working on smart window technologies are profiled in the report. This entry was posted in Smart Windows and tagged Liquid Crystal, Merck, smart windows, smart windows market on November 30, 2017 by jennycolegrove. May 27, 2017, by Jennifer Colegrove Ph.D. I just returned from SID DisplayWeek 2017 in the beautiful Log Angeles, California. It was my honor to meet some of you in person. 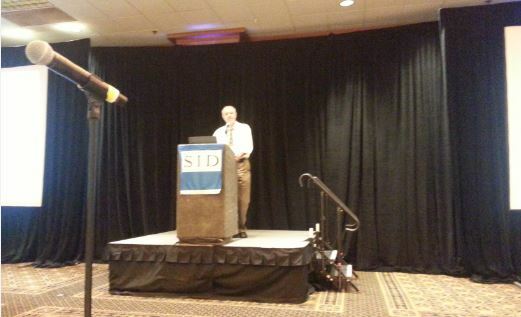 Touch panels, flexible/curved/foldable display, smart windows, quantum dots are hot topics at SID 2017. Each of these fields has some as expected, and also has some surprises. Mr. Bob Miller, Senior Business Manager at Merck/EMD show us its liquid crystal smart windows in large format, see picture here. This is NOT PDLC (Polymer Dispersed Liquid Crystal), but only liquid crystal. How many smart windows technologies are there? What’s the Pros and Cons of each type? Which company is investing in which? 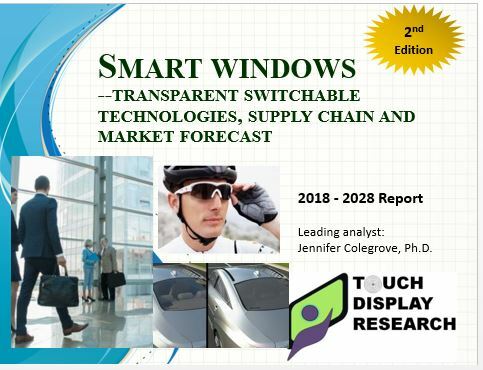 In the recently published “Smart Windows Transparent Switchable Technologies, Supply Chain and Market Forecast 2017 Report,” Touch Display Research Inc., analyzed 19 smart window technologies, which include 16 active smart window technologies and 3 passive smart window technologies. Some can be both active and passive. 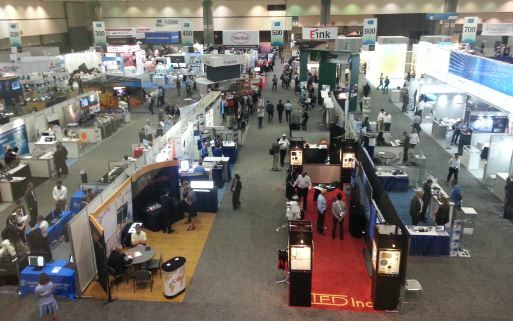 More than 130 companies working on smart window technologies are profiled in the report. What are the surprises of each hot topic? 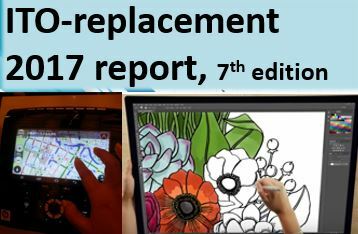 More analysis of SID 2017 can be found in the “Touch and Emerging Display” monthly report. This entry was posted in Conference Review, Displays, Flexible curved display, Flexible hybrid electronics, Flexible OLED, Flexible touch screen, ITO replacement, large touch display, metal mesh, OLED, Quantum dot, smart glasses, Smart Windows, Touch screens and tagged Bob Miller, EMD, flexible curved bendable display, Liquid Crystal, Merck, PDLC, quantum dot, SID DisplayWeek 2017, smart windows, Touch panel on May 27, 2017 by jennycolegrove.